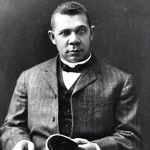 Booker T. Washington was born on this date in 1856. Born a slave, at age 9 he started working in a salt factory and then a coal mine after the Civil War freed him. Describe what you think you’ll do in your first job.